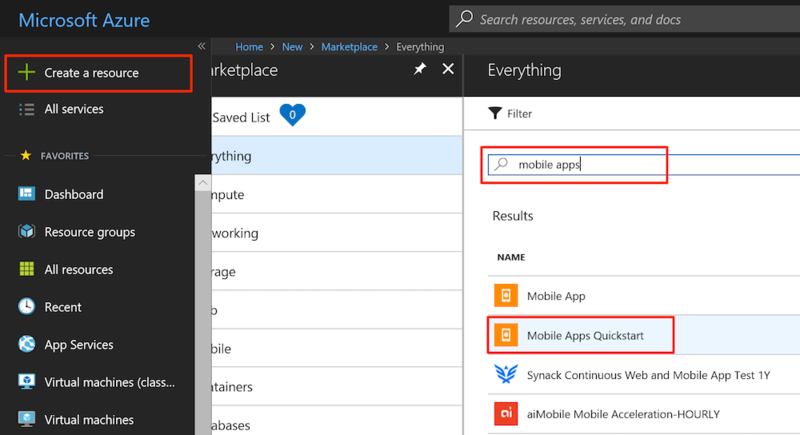 This tutorial shows you how to add a cloud-based back-end service to a Xamarin.Forms mobile app by using the Mobile Apps feature of Azure App Service as the back end. You create both a new Mobile Apps back end and a simple to-do list Xamarin.Forms app that stores app data in Azure. Completing this tutorial is a prerequisite for all other Mobile Apps tutorials for Xamarin.Forms. An active Azure account. If you don't have an account, you can sign up for an Azure trial and get up to 10 free mobile apps that you can keep using even after your trial ends. For more information, see Azure Free Trial. 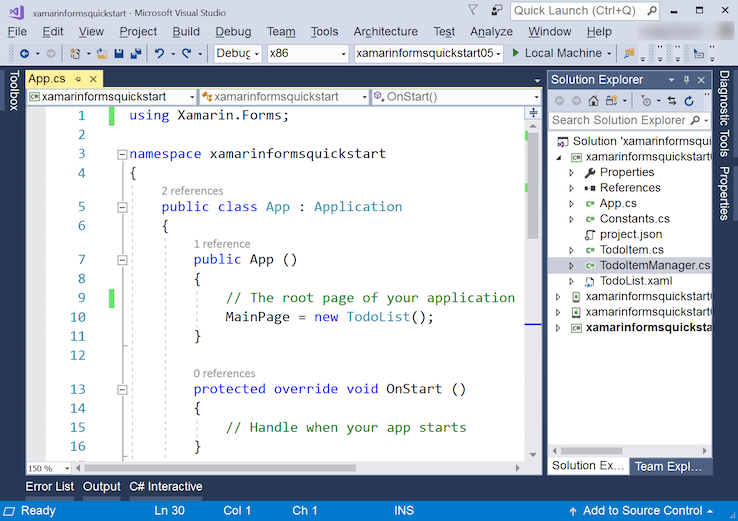 Visual Studio Tools for Xamarin, in Visual Studio 2017 or Visual Studio for Mac. See the Xamarin installation page for instructions. (optional) To build an iOS app, a Mac with Xcode 9.0 or later is required. Visual Studio for Mac can be used to develop iOS apps, or Visual Studio 2017 can be used (so long as the Mac is available on the network). In the search box, type Mobile Apps. In the results list, select Mobile Apps Quickstart, and then select Create. Choose a unique App name. This will also be part of the domain name for your App Service. Under Resource Group, select an existing resource group or create a new one (using the same name as your app). Click Create. Wait a few minutes for the service to be deployed successfully before proceeding. Watch the Notifications (bell) icon in the portal header for status updates. You have now set up a Mobile App back-end that your mobile applications can use. Next, you download a server project for a simple to-do list back end and then publish it to Azure. Click the App Services button, select your Mobile Apps back end, select Quickstart, and then select your client platform (iOS, Android, Xamarin, Cordova). a. Create a new SQL database and server. You may need to leave the connection string name field to the default value of MS_TableConnectionString in order to complete step 3 below. b. Wait until the data connection is successfully created. c. Data connection must be successful. Under 2. Create a table API, select Node.js for Backend language. Accept the acknowledgment, and then select Create TodoItem table. This action creates a new to-do item table in your database. Switching an existing back end to Node.js overwrites all contents. To create a .NET back end instead, see Work with the .NET back-end server SDK for Mobile Apps. On the settings blade for your Mobile App, click Quickstart (under Deployment) > Xamarin.Forms. Under step 3, click Create a new app if it's not already selected. Next click the Download button. This action downloads a project that contains a client application that's connected to your mobile app. Save the compressed project file to your local computer, and make a note of where you save it. Extract the project that you downloaded, and then open it in Visual Studio 2017. Follow the instructions below to run the Android or Windows projects; and if there is a networked Mac computer available, the iOS project. Extract the project that you downloaded, and then open it in Visual Studio for Mac. Follow the instructions below to run the Android or iOS projects. In this section, you run the Xamarin.Android project. You can skip this section if you are not working with Android devices. Right-click the Android (Droid) project, and then select Set as StartUp Project. On the Build menu, select Configuration Manager. In the Configuration Manager dialog box, select the Build and Deploy check boxes next to the Android project, and ensure the shared code project has the Build box checked. To build the project and start the app in an Android emulator, press the F5 key or click the Start button. Right-click the Android project, and then select Set As Startup Project. To build the project and start the app in an Android emulator, select the Run menu, then Start Debugging. In the app, type meaningful text, such as Learn Xamarin, and then select the plus sign (+). This action sends a post request to the new Mobile Apps back end that's hosted in Azure. Data from the request is inserted into the TodoItem table. Items that are stored in the table are returned by the Mobile Apps back end, and the data is displayed in the list. The code that accesses your Mobile Apps back end is in the TodoItemManager.cs C# file of the shared code project in the solution. In this section, you run the Xamarin.iOS project for iOS devices. You can skip this section if you are not working with iOS devices. Right-click the iOS project, and then select Set as StartUp Project. In the Configuration Manager dialog box, select the Build and Deploy check boxes next to the iOS project, and ensure the shared code project has the Build box checked. To build the project and start the app in the iPhone emulator, select the F5 key. On the Run menu, select Start Debugging to build the project and start the app in the iPhone emulator. You'll find the code that accesses your Mobile Apps back end in the TodoItemManager.cs C# file of the shared code project in the solution. In this section, you run the Xamarin.Forms Universal Windows Platform (UWP) project for Windows devices. You can skip this section if you are not working with Windows devices. Right-click any the UWP project, and then select Set as StartUp Project. In the Configuration Manager dialog box, select the Build and Deploy check boxes next to the Windows project that you chose, and ensure the shared code project has the Build box checked. To build the project and start the app in a Windows emulator, press the F5 key or click the Start button (which should read Local Machine). The Windows project cannot be run on macOS. You'll find the code that accesses your Mobile Apps back end in the TodoItemManager.cs C# file of the portable class library project of your solution. If you have problems building the solution, run the NuGet package manager and update to the latest version of Xamarin.Forms, and in the Android project, update the Xamarin.Android support packages. Quickstart projects might not always include the latest versions. Please note that all the support packages referenced in your Android project must have the same version. The Azure Mobile Apps NuGet package has Xamarin.Android.Support.CustomTabs dependency for Android platform, so if your project uses newer support packages you need to install this package with required version directly to avoid conflicts. Add authentication to your app Learn how to authenticate users of your app with an identity provider. Add push notifications to your app Learn how to add push notifications support to your app and configure your Mobile Apps back end to use Azure Notification Hubs to send the push notifications. Enable offline sync for your app Learn how to add offline support for your app by using a Mobile Apps back end. With offline sync, you can view, add, or modify your mobile app's data, even when there is no network connection. 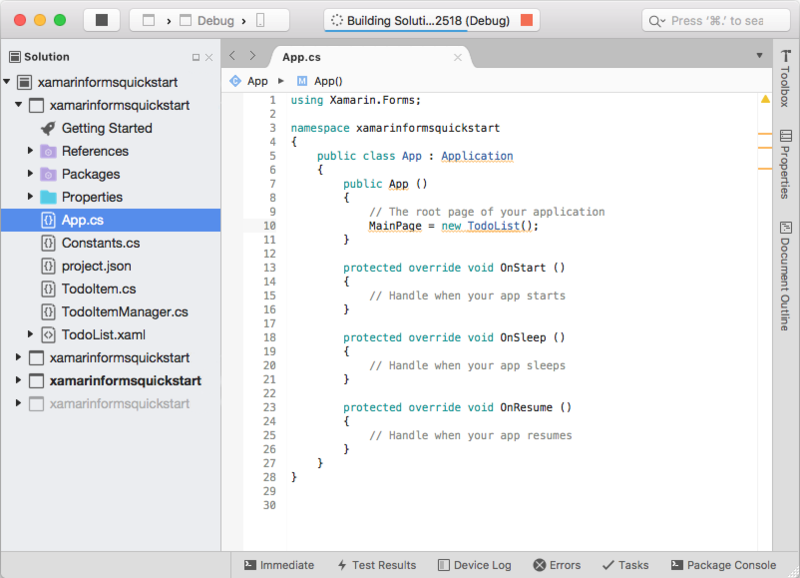 Use the managed client for Mobile Apps Learn how to work with the managed client SDK in your Xamarin app. Using other Azure services with Xamarin.Forms Adding additional Azurew features like search, storage, and cognitive services to Xamarin.Forms apps.